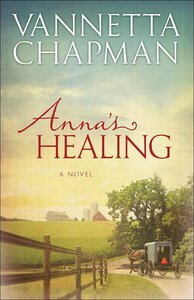 Anna's Healing is the first book in a brand-new collection from popular author Vannetta Chapman. These stories of love and family and Amish community in Oklahoma tell of the miracles that can happen when lives are lived in service to God and to one another. When a tornado strikes the farms surrounding Cody's Creek, Anna Schwartz's life is changed forever. She suffers a spinal cord injury and suddenly finds herself learning to live as a paraplegic. Three people--Chloe Roberts, Jacob Graber, and Ruth Schwartz--join forces to help Anna through her darkest days. Chloe is an Englischer who writes for the local paper. Jacob has recently arrived in town and stays on as a hired hand at her uncle's. And Ruth is her grandmother, a woman of deep faith and a compassionate spirit. Then one morning Anna wakes and finds herself healed. How did it happen? Why did it happen? And what is she to do now? Her life is again turned upside down as the world's attention is drawn to this young Amish girl who has experienced the unexplainable. About "Anna's Healing (#01 in The Plain & Simple Miracles Series)"
Customer Reviews For "Anna's Healing (#01 in The Plain & Simple Miracles Series)"
I thoroughly enjoyed this story. It was like reading a personal testimony from many angles, but instead of stopping at the miracle, like so many testimonies do, it went on to explore the aftermath - how the miracle effected those involves, including the wider community. The main character, Anna was a contented young Amish woman until a tornado reeks havoc around her, and results in her becoming a paraplegic. She is away from home and her immediate family, but is supported by an English reporter named Chloe, the faithful and persistent love of Jacob, a transient Amish man, and the prayers of her very wise and loving grandmother. A miracle results, and people face it in different ways, which you'll find out when you read this highly recommended book.